Kilo the Pug and I share a love of food. 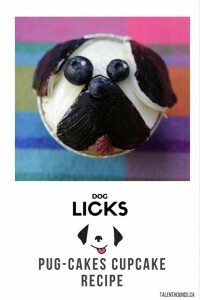 So what better way to party or pawty together than with dog-friendly cupcake pugs from our new Dog Licks Recipe Series over at Talent Hounds. Pug-themed Cupcakes or Pupcakes make the best Treats Ever for a Greedy Pug like Kilo or for a pug lover like me! We started with this simple vanilla cupcake that looks like a mixed pug using fondant and carob and we will be doing more recipes that look like fawn pugs and black pugs. Some cupcake recipes include vanilla but most vanilla extract includes alcohol which is not good for dogs so we left it out. Cream butter and sugar together until the mixture is light and fluffy. Add flour mixed with baking powder and salt alternating with milk. Beat well until smooth. 6. Divide evenly among cups and bake for 17-18 minutes or until a light golden colour on top. The smaller ones cooked faster so you could take them out early. Roll out fondant 2 cm thick. Cut out 1 heart shape, 2 teardrop shapes, and 1 large circle from the fondant. Set aside. Lay the circle shape over the cupcake. Frost one side of the heart and lay upside down on the bottom half of the face. Frost one side of the teardrop shapes and place them as the pug’s ears. Lightly spread some carob paste onto the ears and the muzzle. Stick on two blueberries for eyes and one for the nose using peanut butter. Cut a small tongue using half a strawberry and place on the cupcake using peanut butter. 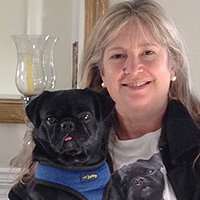 We love Pugs and Kilo sure loved his Dog-Friendly Cupcake Pug. These easy cute cupcakes are perfect for dog and kid birthday parties or celebrations. Do you make treats for your Pug or celebrate birthdays together? Let us know in the comments. Disclaimer: Please note that I am just having fun with these Dog Licks Recipes, making food that looks like cute pups and that my dog, my kids and I can enjoy. I am not an expert, a chef, a vet or a nutritionist, so it’s advisable to consult with your own authority when trying new foods, and also to ensure that your dog’s or your child’s diet is balanced and appropriate & includes all of the nutrients that are necessary for good health. Also please watch for allergies or adverse reactions, especially if using products like peanut butter which can be deadly, and never give your dog chocolate, onions, grapes, xylitol or raisins ( if you have any questions contact your Vet or the ASPCA hotline).